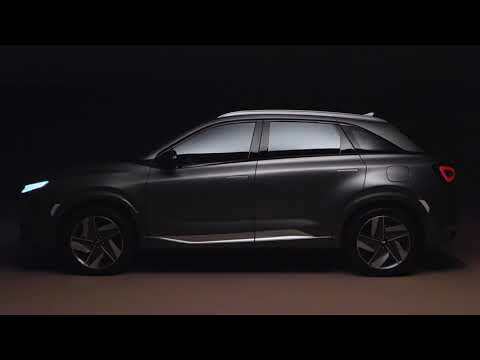 Enter the world of tomorrow with the All-New Hyundai NEXO, presenting to you the seamless and brilliant combination​ of hydrogen power, technology and smart design. It has been designed to be at the top of its game with regards to efficiency, but in conjunction with that, it has most certainly been created to turn heads on the road for all the right reasons. The magic behind the excellence of the Hyundai NEXO is the perfect combination of oxygen and hydrogen, the combining of the two elements allows for a flow of electrons which then acts as a power source for the electric drive motor and charges the 1.56kWh high voltage battery.​ Be prepared to experience a top-class driving experience that allows you to enjoy the thrill of driving without the guilt of nasty emissions - you can be rest assured that the Hyundai NEXO produces none of the harmful particulates or tailpipe emissions​. Instead, it purifies the air as it moves along the road, producing no more than purified air and droplets of clean water​, working hard towards the purification of the environment and making the roads greener and cleaner. The All-New Hyundai NEXO is able to satisfy your every need, whether you need it for your daily work commute or those fun-packed trips with the family, long or short haul, the NEXO is the perfect fit. These adventures and daily trips can be made easier with a quick five minute fill up time that goes hand in hand with a fantastic range of 414 miles (WLTP). The efficiency and brilliant design does not end with its performance and exterior, the excellence continues into the interiors of the All-New Hyundai NEXO. Showcasing spacious and comfortable interiors, allowing you and your passengers to sit back and relax, fully immersing yourself into the enjoyment of driving with maximum comfort. Along with the luxurious space inside, you will also find that the bio fibres, plastics and paint are expertly designed around two LCD displays with excellent resolution, these can be used for a number of things including, route navigation, driving information such as traffic alerts etc, as well as entertainment to make those longer drives feel like a breeze.